The IP door readers connect to the network using TCP/IP protocol. They are just like any other IP network device. You can choose the Isonas IP readers or the pro-series IP readers. The latest Isonas RC04 readers are available in a number of different styles and capability. You can select models that mount on the side of the door frame (mullion) or on the wall. The models provide the option to use your smartphone (Bluetooth) as the credential. The Pro series of IP Readers provides more functionality such as built-in camera, elevator access control, long-range capability, fire alarm door release or emergency lock-down. You can also select biometric readers that verify the person rather than the credential (card) they are carrying. The Biometric IP door readers from Kintronics use fingerprint, finger-vein, or facial recognition to provide increased access security. Reader-Controllers are available in two models: Multi-card technology (125kHZ and 13.56 MHZ) or a proximity-only version (125kHz). Bluetooth® Low Energy (BLE) allows customers to utilize our Pure Mobile application and use their smartphone as their credential. Local mode feature allows readers to function without a connection to the network. This results in faster user response times, less network traffic and reduced host system loading. Tamper detection via accelerometer senses any type of altering and prevents a security breach with the reader. The optional External Door Kit (EDK) provides an increased level of security. Reader-Controllers are available in two models: Smart card technology (13.56 MHZ and 125KHz credentials) or a proximity-only version (125kHz credentials). Intelligence at the door – A single PowerNet™ is capable of storing 64,000 cardholders, 5000 access events, and 32 time zones which can be configured and accessed by an external host system. DB Crystal Matrix Software is no longer available. Pure Access Cloud and Pure Access Manager have replaced DB Crystal. With Pure Access Cloud, you can control your doors from anywhere. Pigtail cables – 10, 25 ft.
Biometric readers such as fingerprint and facial recognition systems are also available. These IP door readers attach to the network providing an easy to install security system. This is new technology doesn’t use a central access control box. Each reader has all the intelligence that used to be in the central control box. This means you can start with one reader and add new readers very easily. For more information about how this new IP access control technology compares to the old technology, take a look at our article Comparison of Door Control Systems. 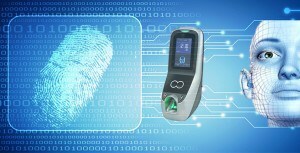 The latest IP readers support various card credential RFID proximity formats. Besides using credentials, you can use pin codes or even your smartphone to open the door. Select readers with keypad, indoor or outdoor models, with trim kits and pre-cut pigtail wiring. The readers accept HID, Isonas format proximity credentials, and include a choice of pigtails (10′ or 25′). Since these door readers attach to the network and use PoE (just like IP cameras) they are very easy to integrate allowing you to create a complete security and safety system. We provide complete integrated systems so please contact us (914-944-3425) for help designing your system. Convert your old door control panel system to the latest IP connect system. IP Bridge hardware allows you to convert panel-based access control readers at your existing doors to our pure IP solution. By replacing the subpanels with a direct network connection – and eliminating the need for specialized wiring and backup power – IP Bridge not only allows you to grow your system but also to save money by reducing equipment and maintenance costs on your existing doors. We provide integration of door access control systems with IP camera systems and door intercoms. These door locks can be integrated with IP camera systems and intercoms that can be used to manually control entry. Contact us for help in creating your IP security system.